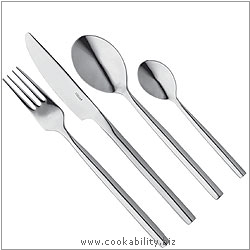 Six table forks, table knives, dessert spoons, dessert knives, dessert forks, soup spoons and teaspoons. Also two serving spoons. Supplied in a smart gift box.